Sooo, these projects are all so quick and kinda throwaway that they don’t seem worth a post of their own. 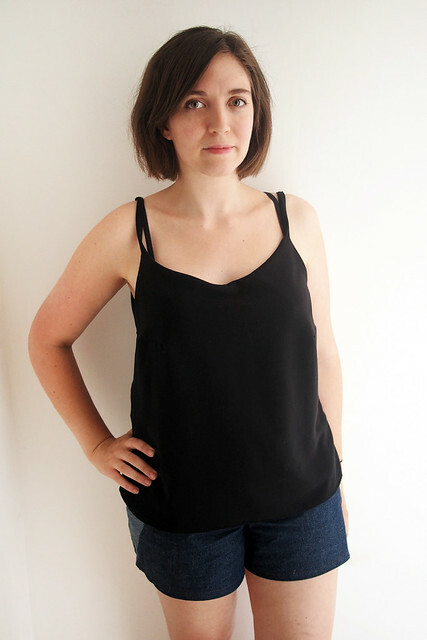 But I’ve been rigorously testing out seemingly every cami/tank/singlet pattern under the sun lately (and wearing them almost daily – London is HOT, by the way) so I thought I’d jot down my thoughts on each of them. 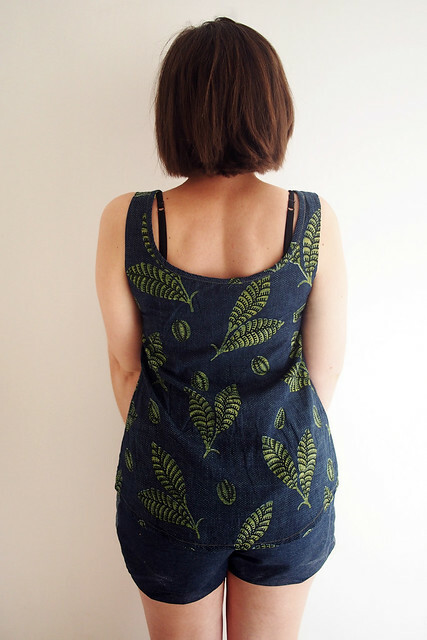 You probably recognise this first cami from its background role in some other posts – I barely took it off for like two weeks straight when I made it. It’s a Salme double-layer cami made from a slinky viscose remnant from Abakhan. Unfortunately, a quick learning for me was that the seemingly simple camisole proves tricky to fit on my body. I have a very small high chest / overbust measurement compared to full bust and overall frame. That means I get mad gaping through necklines (fixed here with a crafty front box pleat) but then get tightness through the bust and underarms if I size down too much. I’m working to perfect the fit with each cami I make, but luckily I actually rather like the pleat detail here. From what I’ve already learned in pattern class this week, I could/should have pivoted out that excess into the bust dart. Another Salme one using the offcut from my Anna dress. This time I folded the excess fabric out of the neckline, but forgot that the pattern doesn’t include seam/hem allowance and merrily cut my fabric without it. Luckily it does still fit as I sized up anyway as I always do for woven tops, but it’s a wee bit snugger than I generally like. 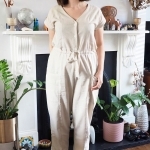 I like the Salme pattern because the underlayer is attached RS together all around the neckline, meaning you don’t need to finish the raw edges with anything fiddly like bias or facings. I’ve been using my seemingly endless stash of stretch mesh as linings to avoid adding much weight or bulk. Lucky number three, a plain black self-lined slinky viscose version of the Salme – perfect fit! Ummmm, this one has tiny tumbling cats on and I have run out of things to say. Cats. 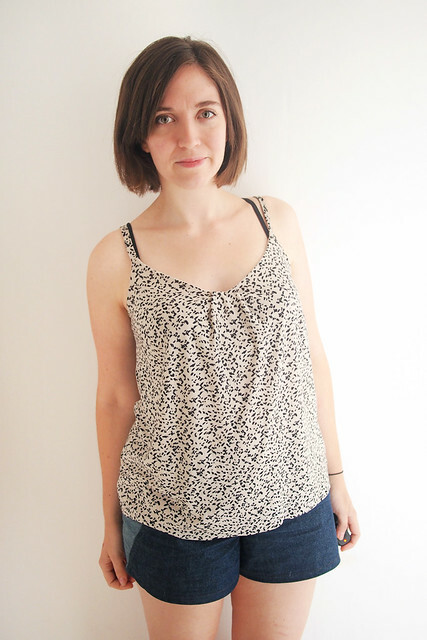 Here’s a different pattern, the free Diana cami from Sewloft, made up in a beautiful Liberty tana lawn that I bought as a pre-cut 1m from Liberty’s sale. (Anyone know the name of this design? I love it so much!) I had exactly the same gaping issue, and pinched it out with a front tuck this time. It doesn’t hang quite as nicely as the Salme one as it has no bust darts – notice the ripples down the sides – but that could also be a side effect of the crisp lawn. I love the back detailing on this one, even if it’s not so bra-friendly. I lined it in white cotton voile to make the print ‘pop’ a bit more and get the same clean neckline finish as the Salme one (the pattern as written is unlined with self bias to finish the neckline). I treated the lining and main as one when sewing the side seams, but I think I prefer the lining hanging loose inside like the Salme one for an easier drape. 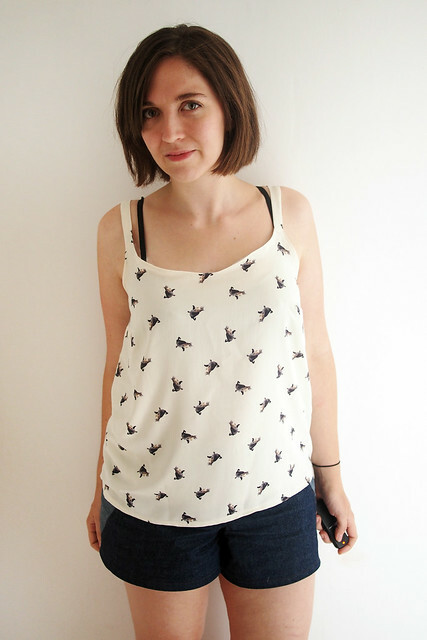 Finally the free By Hand London Polly top. I don’t know why I held off making this so long – it’s so sweet, fast to make, and a really good scrapbuster. This is made in a Ghanaian wax cotton that I scooped up from a lovely lady at Spitalfields market for just £2. It was already half-sewn into a skirt so I had to cut carefully to make it fit; the awkward seam right up the front is an unfortunate effect of that. The fabric has two ‘good’ sides with a nice colour contrast; I think the centre panel is supposed to be the wrong side. So there you go, a veritable bevy of camis. 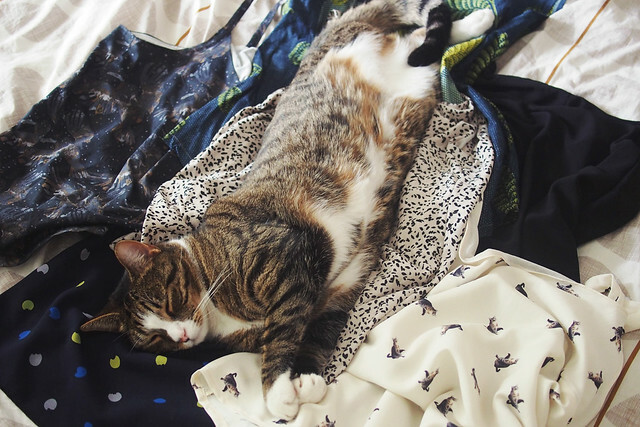 Be rewarded by my cat lounging inconsiderately on my pile of to-be-photographed tops, the adorable little jerk. Which is your favourite, Yoni? No surprises there. They’re all so pretty but my favourite is of course the one with the kitty print, not just because I’m a cat lady but because it looks light and airy and this whole ‘summer’ thing is too warm for me. 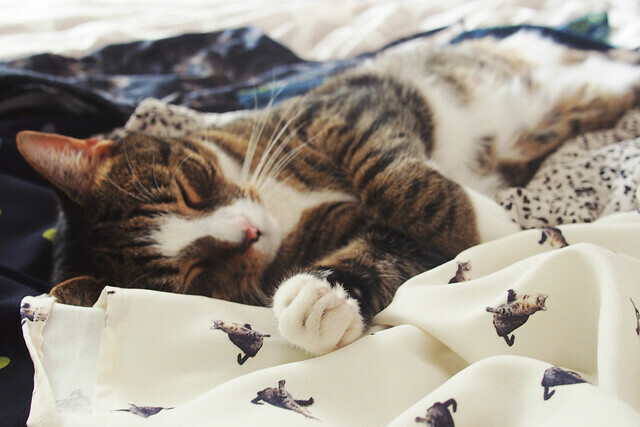 Where did you get the cats fabric? It’s amazing! Sterling effort on the camis btw, one can never have too many. It was from this eBay seller, sadly looks like they’re out though. Wish I’d got more! I love your BHL Polly, so many colour blocking possibilities! Wow, you’ve been busy! I like your Polly Top best – it’s great when fabrics have 2 good sides. 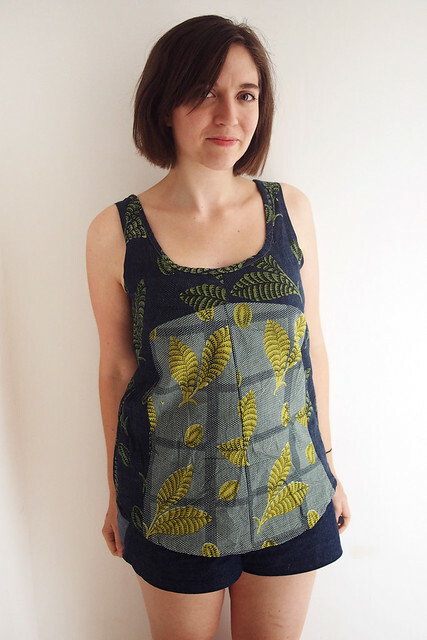 I’ve just made a Polly Top too, but found it a bit tricky to fit..
Whoa! Love all of these! Cami’s are such a staple, and you’ve made some great ones here. 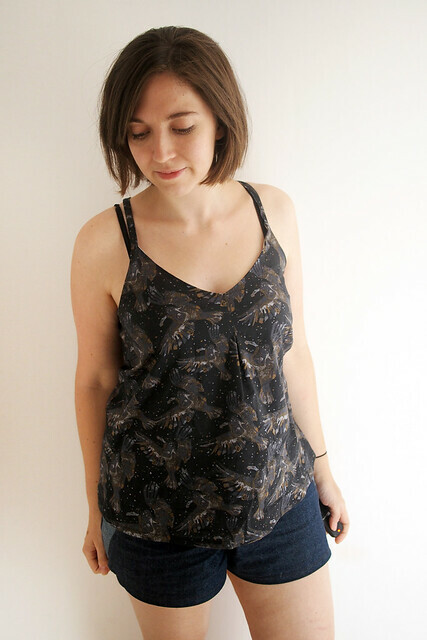 That Liberty print is amazing, and I really like how your Polly top turned out. That gif is crazy! Really like the new photography wall and a Polly dress sounds like a brill idea! I think I recall seeing one on the BHL blog, but I think it could be bettered (no offense BHL ladies). Did you make those shorts too? I did, they’re a wearable toile of the Katy & Laney tap shorts. Love em! Yoni def my favourite, I just wanna reach into the screen and rub his belly! I have that bird print too, just waiting for the right pattern! I’m in the middle of making a Polly, its a great pattern. I love the fabric you used for yours. Your hair looks fab too, have you had it cut shorter? Yes just a trim, good hair days are few and far between in this heat! Definitely a bevvie of beauties!! 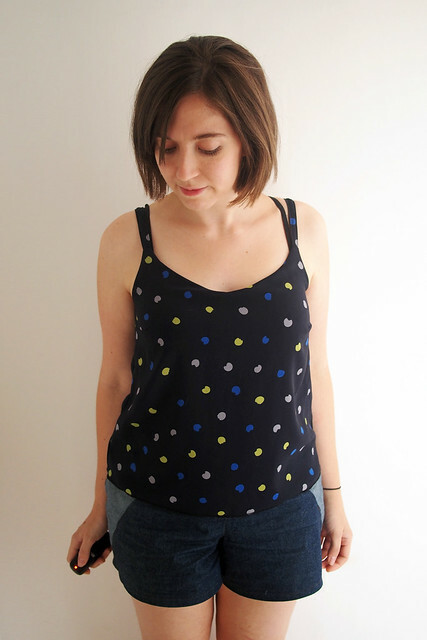 Such a cool round up of all your cami sewing!! I love that you’ve gone for a similar style and have made lots of varieties in different fabrics. I can also how fixated you’ve become on a style that works so well on you. Looks great with shorts, but I bet cute with skirts and even jeans and a cardi. Great! Hope I can figure a way to wear them when it gets cooler too! I think they’ll layer nicely. They’re all great, you’ll get heaps of wear out of them. 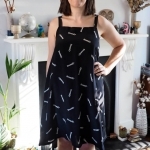 If you go to the garmenter website they also have a step by step how to change their basic bodice block to a camisole style dress, similar back to the Sew Loft Cami, so if you’ve a great bodice block you might be able to draft yourself a better fit in the upper bust. I’m learning I have a similar issue. Your plain wall is nice, but I love your wallpaper wall too! A chance of scene is as good as a holiday I say! this is so smart! i’ve had cami’s on the brain lately as well, and what a good idea to just make a bunch in a row. seems like a super obvious way to tackle a wardrobe hole, but you know how it goes! i’m sure these will come in handy as layering pieces all year round! A brilliant selection – I too love the cat fabric. The plain background really accentuates your colourful tops. Cats! Love the kitty cami and the cameo by your real life kitty. These all look so wearable and the line up will come in handy for the upcoming Australian summer. I’m so glad you shared these! Basics are so important to a wardrobe, and I end up wearing the camis I have made all the time in the heat of summer. You put some serious effort into cami sewing- Bravo! I’d love to hear more about what you learn from your class in the future too. These are amazing! I love that you’ve tried so many patterns—I’m also really into sleeveless cami’s / tanks because I like showing off my tattoo. & it’s nice to hear of someone making that Diana pattern. I have it all printed out but wanted to wait and see an “in the wild” version before I attempted it. The kitty fabric is also, of course, incredible! These are great. I have been thinking that I need to find the ‘perfect’ cami pattern too…I seem to have quite a collection of 1m pieces of fabric (read – they were expensive and I could only bring myself to buy 1m!!!) and am thinking cami’s would sort that out. How much fabric does the Salme double-layer cami take? Do you actually make it double layer or can you get away with one layer and a facing do you think? Such great camis! I love the one in your leftover Quito fabric. The Liberty print is called “Storm”, I picked it up in a couple of different colours last time I was in Shaukat, such a great print. Thank you! Oh gosh, the other colourways are gorgeous too. I get how you’re testing every top under the sun. You have had such a warm Summer so far. Fabulous, think my fave is the wax print Polly. But they are all awesome and perfect for this heat. Tiny tumbling cats! I love the pattern. That and the slinky black viscose are my favorites. Thanks for posting this. I’m searching around for easy camisole patterns and your insights are helpful.